I've finally started the journey towards my own Land Rover expedition. 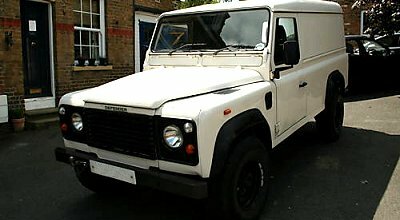 In June 2009 I purchased this 1992 Land Rover Defender 110 Hardtop 200Tdi from eBay. I've already found myself trawling catalogues and websites for things I can buy to upgrade it with. My journey to make the ultimate expedition vehicle has begun. A Defender has the ground clearance, the ease of modification and simplicity of maintenance that aren't a given with a Discovery. The 110 was a definite choice over the 90, as they have a better load space to carry expedition equipment. I would have settled for a Station Wagon, although as I don't have kids or intend to carry many people on expedition, the Hardtop allows me to get even more stuff in the back. It means there are fewer doors to rust and less potential break-in points! It's also fairly standard spec so gives me a blank canvas on which to design my ultimate expedition vehicle. It would always prefer to have a pre-Td5 engine that didn't rely on electronics that could be mended in the middle of nowhere with simple tools. The 200Tdi, although an earlier model than the 300Tdi, has a good reputation for reliability, and it's well known that a diesel is the best expedition engine. This one being at 205,000 miles still has the potential for plenty of life to go. The 300Tdi's, whilst of similar performance, have reliability issues with head gaskets and timing belts on the early engines. Having said that, I would have settled on either. The fact it's a 200Tdi meant I was able to pick it up for under £2000. Had it been a 300Tdi the price could have been a lot more. I have seen better examples of Defenders, but a lot worse. From the photo it does look quite gleaming. It'd had a fair amount of work done already such as a new clutch, tires, modular wheels, timing belt and the engine runs smoothly; all of which help to settle the nerves when buying a 17 year old Land Rover. However, the hinges are rusty, some parts of the chassis are a bit crispy, the radiator's damaged, the fuel light stays on, the doors are rotting, the transfer box leaks from both ends and so do the sump and rear diff. The fact it has a few niggly issues makes me glad that I have a Land Rover that I can learn from and feel more confident in fixing should I find myself lost in Africa with no mechanic. As i'm not going on expedition quite yet, I'm glad I afforded myself the time to research the market and strike when the factors were right. After 15 months of ownership, I sold this Defender. Read more about the replacement expedition Defender.